Gov. Kate Brown signed legislation on Wednesday to raise the age to buy tobacco and nicotine products from 18 to 21. SALEM — Oregon has become the fifth state to raise the legal age to buy tobacco from 18 to 21. Gov. 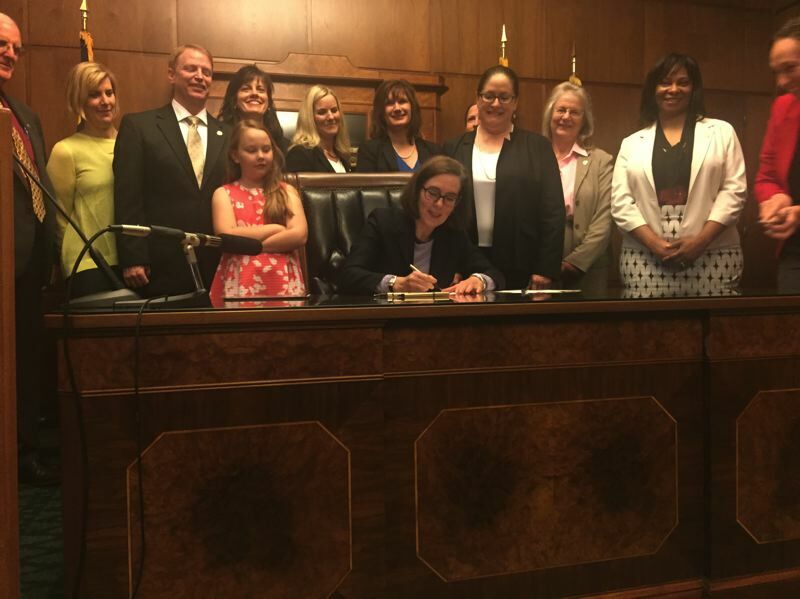 Kate Brown signed the legislation into law Wednesday, Aug. 9. The law, co-sponsored by a Republican and Democrat, aligns the legal age to purchase tobacco and nicotine products with that already established for alcohol and marijuana. Raising the legal age to buy tobacco products "significantly reduces the number of youth who begin using these products and become addicted to them, saving Oregonians billions of tax dollars, and the lives of thousands of loved ones, each year," said co-sponsor Rep. Rich Vial, a Republican whose district includes portions of Hillsboro and Scholls. The law enacts fines ranging from $50 to $1,000 for individuals or businesses that distribute or sell such products to buyers younger than 21. The new regulations also ban a 21-year-old from possessing tobacco or nicotine when on a postsecondary education campus, effective Jan. 1. Vial and Sen. Elizabeth Steiner Hayward, D-Beaverton, sponsored the legislation to help prevent youth from becoming addicted to tobacco. About 1,800 Oregon kids become smokers every year and an alarming 24 percent of Oregon's 11th graders report using tobacco products. The increase in sales age will keep tobacco products out of high schools, where young teens often access them from older classmates, according to advocates with the American Cancer Society Cancer Action Network. About 95 percent of adult smokers started smoking before age 21, according to the Cancer Action Network. Health advocates hope a reduction in young smokers will translate into fewer tobacco-related diseases, the state's leading cause of preventable death. The statewide law would follow a similar law enacted in Lane County in March. Oregon follows Hawaii, California, New Jersey and Maine in raising the legal age to buy tobacco. Hawaii adopted an age 21 threshold in 2015, followed by California last year. Maine and New Jersey both adopted an age 21 threshold this summer. More than 200 cities and counties, including New York City and Boston, have similar laws. Despite endorsements from public health advocates and an easy passage in the Senate, the bill faced a setback when tobacco company Altria hired former state Sen. Margaret Carter, D-Portland, to lobby against the measure, according to a story by Willamette Week. Carter, the first black woman elected to the Oregon Legislature, argued to lawmakers that raising the legal age could prompt racial profiling of minority youth, according to the alt-weekly article. The House Rules Committee amended the bill Monday, July 3, to eliminate the potential for that problem and ensure individuals younger than 21 are not penalized for possessing tobacco.